First awarded in 1891, the Senior Championship Trophy was awarded to the champions of the Amateur Hockey Association and became the premiere hockey trophy in Canada. It was known as the forerunner to the Stanley Cup. This beautiful silverware was designed with hockey scenes on its middle bowl as well as an inscription quoting that if a team should ever win it three times, it would become that teams forever. Coincidentally the Montreal Wanderers won the trophy the first three years, thereby retiring the trophy from competition. 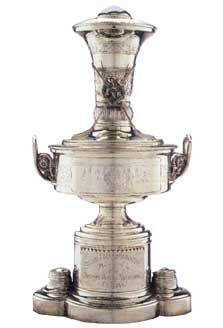 It was at this time that Lord Stanley donated the "Dominion Challenge Cup", more commonly known as the Stanley Cup.